This was the visit I was most looking forward to. I knew LdH would be special but it was my failure to visit this property on a previous trip that was the motivation to return to Rioja. Contino is part owned by CVNE and the growers who owned the land. It's still a 50-50 split. It was set up to produce wines in the Bordeaux Chateau style. No grapes were bought in. The wines were made from a single property. It was a unique idea in 1973 not so rare these days. 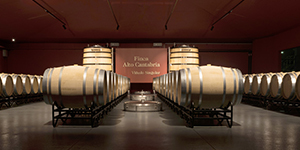 The winery produces a RESERVA, a GRAN RESERVA a single varietal GRACIANO and VIÑA del OLIVO. A special selection wine is available by the half barrel to friends and family of the winery. A sort of wine club. So count yourselves lucky Spanish Veremaites! We were given a 'tour' of the vineyard from the warmth of the interior of the winery by Jesús Madrazo. An aerial photo allowed him to explain to us the different plots and their quality level. The most interesting aspect is indeed the aspect! The sun rises at one corner of the estate and as the estate has, basically, a horseshoe shape it continues to receive sunshine throughout the day. This is great in poor years as it receives enough sunshine but problematic in warm years as it has an effect on alcohol levels. The other benefit of it's location is that the Graciano ripens well and evenly. Jesús Madrazo joked that for many growers Graciano meant "No Thanks" (Gracia-No! )as it is a bitter grape when unripe. The oldest plot of Graciano dates from 1979. The remainder was planted in 1989. Like it or loathe it Graciano is the special ingredient in Contino's wines. The first single varietal was bottled in 1994 but it is present in all cuvees from this winery. Then it was off to the business end of the operation. The barrel samples came thick and fast. The 08 Garnacha was a revelation! This was one of the freshest and most approachable wines of the entire trip. It had a lovely firm core, not thin and spirity like Garnacha can be some times neither was it hot and fat like some more over extracted examples. I don't think we will ever see this wine bottled separately as it usually goes into the Gran Reserva, but with no GR in 08 what to do?. I made a mental note to check out some 08 C9's in case they are as good as this! The selection Jesus Madrazo 09 was also very good, a baby Olivo. Contino now also produce a white wine after some years of experimentation. The Contino Blanco 09 has a pale yellow colour. Floral nose. It has a buttery richnes to it but isn't flabby. There seems to be a trend in Rioja to produce white wines (once the main wine style of the region). Not only was Basilio's wine very good but the Contino wine also impressed and Muga also have a white in their portfolio.And the next winert we visited, Abel Mendoza, bottles a range of single varietals and a blend. Single varietal. Aged in French and Hungarian Oak for 13 months. Cherry red colour. Explosive nose. Very fruity and full on. Modern styled. Very fresh and vibrant. Ages very well. A 96 I tried was like a recently bottled wine. Good wine but probably my least favourite of the range. One of my favourite Spanish wines. Lovely aromatic nose. Hint of mint. Very lush. Plush mouthfeel. Smooth tannins. Silky, modern and moreish. Incidentially this wine won best Tempranillo as did the 2001. Contino is the only winery to win this twice. Having bought a case of this last month I suppose you could say that I like it. Red Cherry colour. Ripe fruit from a great vintage (JM rates the 04 higher) Right now this is 'modern' but these reservas change substantially over time. Once secondary and tertiary notes develop they are much different. Right now there is rich fruit on the palate and a splash of oak as you would expect after two years in a mixture of French and American oak. Mainly Tempranillo 85% Graciano 10% Mazuelo and Garnacha making up the rest. My note on this is a touch on the brief side. Lovely developed nose of orange peel a touch of camphor. spine of fruit still there. As ever the clock was against us. Jesús was off to a tasting dinner and yet another winery was waiting for us. A simply fantastic visit to a great winery and entertained by the most hospitable of Men. We were greeted by Jorge Muga, the winemaker, and led on a tour of the winery before tasting a few bottles. The tour began at a certain set of barrels. The barrels contain their Rosé wine, or more accurately their Clarete, a mixture of red and white grapes. As Jorge said a winery will never be famous for its Rosé but this wine saved their family business. His grandmother worked at La Rioja Alta and met his Grandfather at the winery door when he came to sell his grapes. In those days winemakers had contact with grape growers once a year- when they came to sell their harvest. They married and set up a winery together. Muga was born. But the life could have been cut short. Shortly after its foundation the Spanish civil war broke out, followed by the second world war. Money was tight but their cheap and cheerful Rosé sold well from their cellar in the heart of Haro. The economic storm was weathered and Muga survived. So next time you pick a Torre Muga off the shelf don't dismiss the Rosé if it's nearby. It's a very impressive winery. There are over 9,000 225 litre barrels. The wines are racked every 3 months by a team of 26 people. Jorge Muga made some interesting points about how wine making and grape growing has changed. He points out that in the past winegrowers farmed plots now they farm plants. Historically sites had a mix of grape types but the entire plot would be harvested together. So, some grapes would be perfectly ripe, others less so giving more freshness and higher acidity than one finds nowadays. He spoke of the need to go back to masal selection and thinks winemakers need to consider massive replanting to combat the effects of global warming. He says he sees insects in the vineyards that normally you only see in very warm Valencia. At Muga they plan to plant Mazuelo and Graciano at higher altitudes. Muga makes 95% of their own barrels and they are the only winery to make their own wooden Vats. Though these vats can last about 35 years. They add no yeast. That naturally present in the winery does the job. Indeed when they introduced a yeast for their white wine they found through analysis that the natural yeast attacked and killed it. Fermented in new French oak. Pale yellow. Lemon, citrus notes. Quite lively, not fat but cream from the oak. Grapes from Prado Enea and Torre Muga vineyards. 70 % Tempranillo, 20 % Garnacha, 10 % Mazuelo and Graciano. 6 months in vats 30months in barrels. Black cherry with a red rim. Spice on the nose, Black fruit spectrum. Good mouthfeel but a firmness on the finish that suggests patience will be rewarded. Good. 80% Tempranillo, 20% Garnacha, Mazuelo and Graciano. Dark cherry core with garnet at the rim. Traditional rioja style nose. Blood, meaty, spice, earthy. Very silky mouthfeel. Really coats the mouth. Lovely long finish. Aged for 6 months in wooden vats, 18 months in new French oak barrels and at least 12 months in bottle before release. More 'slutty' than the Prado Enea. Hints of vanilla. Black fruits. Minerality. Certainlt tastes 'modern' but lovely silky palate. Nice sweetness. However if the '94 is nything to go by this will morph into a different wine. We left the tasting room with smiles on our faces and a spring in our step. Another great tasting and another fantastic and friendly host. Congratulations!!! And thanks for sharing your experience! For sure you enjoyed a lot in Rioja, actually María José López de Heredia, Chus Madrazo and Jorge Muga are involved in a blind tasting group called "Adivinos". They are collegues, friends and 3 of the most important producers in th region. Chus told me about the tasting group. Sadly we didn't get to meet Maria José on this trip but that bodega speaks for itself. I had a very bad experience of a Prado Enea some years back and I was put off this wine. (perhaps a faulty bottle, it was a vintage from the 80's). Thos 01 was fantastic as have been some other vintages. Not everyones style these days but an excellent wine in my opinion. The Continos are different again. The Olivo is a really lovely plush wine. I haven't had anything older than 01. I don't know how it develops. It's not cheap but it is very good. Some of the older Reservas are awesome! The 81 tasted on this trip was a treat. I've had the 74 as well and it's to die for!! If the 08 Garnacha ever appears in a bottle buy it! I've only had the Prado Enea once and I thought it was lovely, charming is the word. The truth is that I used to have preconceived ideas about Riojas and it has only been recently that I have become aware of my mistake. You are obviously an expert and I'll be on the look out for your posts. Funny as it may seem, I think there is a lot I can learn from an Englishman who loves Spanish wine. If you can get hold of it buy a bottle of the PE 01. I don't know what your preconceived ideas were but I had some as well! When I discovered Spanish wine I was drawn to the ripe fruit of modern Riberas. And while I still believe there are great wines in this style I feel Rioja offers an alternative to those wines. The words 'modern' and 'traditional' are shorthand and are not absolute. Indeed the 'modern' Torre Muga 94 now tastes quite 'traditional'. But hopefully you understand what I'm trying to say. Mass produced 'supermarket' Riojas of the past were not a good ambassador for Rioja and put off me and many others. Thanks for the nice words but I'm no expert just very curious and someone who spends too much money tasting wine! However living in England allows me to taste a wide variety of wines as it's a very open market. Most of my wine loving friends prefer the taste of older Riojas to anything else Spain offers. I like a wider range. I have recently bought Berberana Reserva 1973 and Vina Pomal Crianza 78 and I look forward to trying them. My wine loving friends in Spain think I'm mad buying some of these!! Sorry for taking for granted you were English! This the great thing about Spain, you just don`t get a chance to get bored!